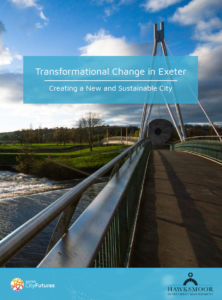 Hawksmoor Investment Management’s Jim Wood-Smith and Exeter City Futures held a joint seminar to discuss the challenges of creating a sustainable future for Exeter. Seminar attendees included the City Council as well as public sector, planning, professional services, developer and infrastructure organisations in Exeter. The event canvassed ideas and solutions for transformational change in the city over the next two decades and discussed potential reforms to financing, planning and delivery methods that could be employed to achieve the shared aspirations for the city. Jim gave a presentation on the topic ‘How sustainability is changing Corporate & Investor Behaviour,’ and also wrote the Foreword to the working paper.